Oculus Ready PCs are priced competitively when bundled with the Rift, but DIY lets you spend more on graphics. The computing industry’s betting big on the coming virtual reality revolution, but pushing headsets like the Oculus Rift and HTC Vive out to the masses isn’t as easy as you may think. Running them requires some pretty beefy PC rigs, and diving into nitty-gritty CPU and GPU specs—sadly—isn’t most people’s forte. That’s where VR certification programs that guarantee VR compatibility come into play. On Tuesday, Oculus revealed the first batch of “Oculus Ready” PCs from Asus, Alienware, and Dell, complete with discounts if you buy them bundled with the Rift. The story behind the story: A couple of interesting tidbits immediately leap out when perusing the hardware inside the first batch of Oculus Ready PCs, but the most glaring is the utter lack of AMD’s Radeon graphics cards. That’s startling, as AMD’s been a major VR proponent and Oculus supporter. Oculus’ minimum required PC specs definitely include Radeon recommendations, and the Vive-optimized HP Envy Phoenix offers Radeon cards as standard options. The first batch of Oculus Ready PCs. Speaking of the minimum required specs, the majority of these Oculus Ready PCs stick to them: A GTX 970 or AMD Radeon R9 390, an Intel Core i5-6400 (the Skylake equivalent of the older, Haswell-based Intel i5-4590 officially listed as the min spec), and 8GB of RAM. Prices for the builds vary, however, thanks to changing RAM and storage offerings. Regardless, people who aren’t afraid of rolling up their sleeves and building a PC can cobble together an Oculus-ready PC of their own for a bit less money, even after you factor in the bundle pricing available when you buy some of these PCs with a Rift—though it won’t save you as much as you might expect. It’s worth it, though, and I’ll explain why. Grabbing a Core i5-6400 ($190), 8GB of DDR4 RAM ($60), a 1TB hard drive ($50), a decent case ($100), and a decent motherboard ($100) will set you back about $500. The only component left after that is a graphics card: Various GTX 970 models can be found for as little as $300, while Radeon R9 390 models—which tends to offers higher frame rates than the GTX 970—frequently dip as low as $275. Even if you opt for a pricier GTX 970, that’s just $800. Add another $100 for a copy of Windows and you wind up at $900. That’s $50 to $100 less than the Oculus Ready bundles, and $150 or cheaper less than the same PCs when you aren’t buying a bundle. The Oculus Rift headset, being used with made-for-VR Oculus Touch controllers. 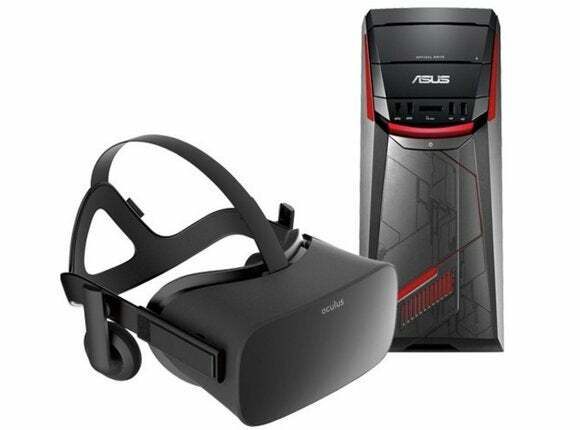 Drop another $600 for the Rift headset itself and you’re left at $1500, or the same price as the cheapest Oculus Ready PC bundle, with the Asus G11CD. Yup, that bundle discount can make a difference. But the other PCs with similar specs start in bundles costing $1,600, according to Best Buy’s website, and you save even more money if you’re looking to replicate the more powerful Oculus Ready PCs. It’s definitely worth going through the hassle of building your own PC to put that extra $100 or more towards a beefier graphics card if you feel capable of pulling off a DIY build. The minimum recommended graphics card for the Oculus Rift may be the GTX 970/Radeon 390, but in order to play a VR experience that doesn’t make you feel ill, games need to hit a smooth 90 frames per second. Sure, the min-spec graphics cards might be able to hit 90fps at the Rift’s 2160x1200 (1080x1200 per eye) resolution in lighter games like Lucky’s Tale (which comes bundled with the headset), but there’s little chance of those cards nailing a consistent 90fps in more strenuous games like space combat game EVE Valkyrie (which also comes bundled with Rift preorders). Elite: Dangerous, which is very similar to EVE, already said you’ll need a $500 GTX 980 at minimum for VR—higher than the Oculus Rift’s humble requirements. In other words, the more money you can toss at your graphics card for VR, the better. Building your own Oculus-ready rig lets you do that, though it’s wonderful to see these easy prebuilt bundles available for people who want things to work without all the DIY hassle.